A traveling junket of talent came to Denver in December to promote their new film Glory Road. The film tells the story of the first all-African-American basketball champions in the NCAA. Depending on your age, it may be hard to imagine college hoops being a majority white sport, with only token black players, but it was less than forty years ago that this color barrier was broken. 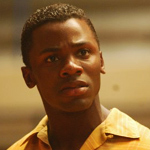 My first interview of the day was with Derek Luke, whose first feature film role was the title character in Antwone Fisher. Luke, who played opposite Denzel Washington, was an unknown and therefore a risk for producer/director Washington, but it payed off. Since then Luke has starred in Biker Boyz, Pieces of April, and David Mamet’s Spartan, to name a few. The subject of many interviews at the release of Antwone Fisher, Luke quickly gained a reputation for being an all-around nice guy (When a fellow reporter, joking, asked Luke to dis his fellow reporter’s mom, Luke came back immediately: “You have a nice mom.”), devoted to his wife and genuinely thankful for his good fortune. On screen, Luke cuts a striking, imposing figure with his bald head and probing eyes. If he seemed smaller in person, he was no less intense.